The New York City Connected Vehicle Pilot Deployment (NYC CVPD) was demonstrated to participants of the Intelligent Transportation Society of New York (ITS-NY) Annual Meeting and Technology Exhibition in Saratoga Springs, NY on June 13 & 14, 2018. 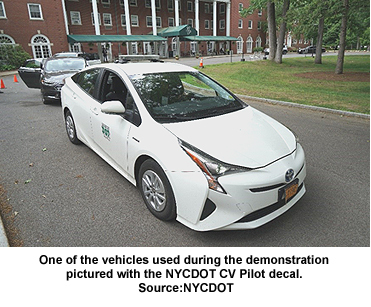 The New York City Department of Transportation (NYC DOT) along with their engineering consultant TransCore offered attendees a drive along demonstration. 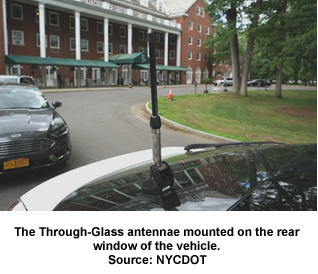 Vehicles installed with a Dedicated short-range communications (DSRC) Aftermarket Safety Device (ASD) were driven on the roadway surrounding the hotel the meeting was held at. Due to the unplanned demo for a Roadside Unit (RSU), all applications demonstrated were Vehicle to Vehicle (V2V). Blind Spot Warning (BSW) – Alerts the driver of vehicles alongside your car which may be in difficult to see as they are accelerating and passing from your left side. Electronic Emergency Brake Light (EEBL) – Warns the driver of a hard braking event in front your vehicle to encourage a deceleration. EEBL functions even when the driver's view is obstructed by other vehicles or poor visibility. Forward Collision Warning (FCW) – Alerts the driver of a potential collision with a slower moving or stationary car located in the path of the vehicle. Intersection Movement Assist (IMA) – Warns the driver, when approaching an intersection, if another vehicle is entering the intersection and there is a potential conflict. 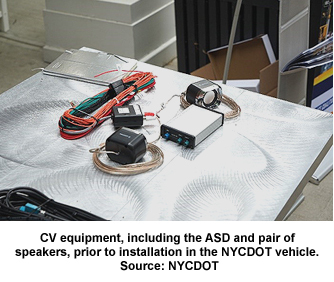 This was the first demonstration to the general public offered by NYC DOT of the NYC CVPD applications, and during the course of the two days, approximately eight drive along demonstrations were performed. When deployed, the NYC CVPD will rely on multiple data feeds to determine location and speed. The NYC CVPD will augment Global Navigation Satellite System (GNSS) data with triangulation from the RSU signals and in addition, the ASD will be tethered to the vehicle. Tethering taps the ASD into the CANBUS to acquire speed data directly from the vehicle allowing it to make use of dead reckoning. For the demonstration, the vehicles were untethered and relied solely upon reception of GNSS signals to determine the speed and location. Unfortunately, the designated roadway for the demonstrations had thick tree coverage. The lack of open sky disrupted the GNSS signals and therefore the applications were unreliable. In the future, it is important to augment the GNSS signals with tethering and deployment of RSUs. At a minimum, ensure the vehicles are tested on the selected roadway prior to the event to ensure there is adequate sky visibility to allow the ASD to acquire GNSS signals. Due to the lack of sky visibility, the demonstration was moved to a secondary roadway that was not a closed course. This roadway was open to the public and was accessible by joggers, walkers, parents with strollers, golfers and dogs. Other vehicles also utilized the roadway. To ensure the safety of all the participants, ideally the roadway would be closed to the public. Another knock-on effect was that the roadway used for the demonstration was smaller than ideal to safely perform all of the maneuvers for the applications. This required “tuning” or adjusting the applications being demonstrated to operate at slower speeds – where the time-to-collision is longer and the rate of deceleration is lower - which, under normal circumstances, would lead to too many false alarms. These parameter adjustments were made during the demonstrations in regards to both the Host and Remote vehicle speed thresholds in order to simulate the safety application effectively in the test roadway. This reiterates the need for multiple tests of the applications to ensure that the ASDs function properly in the demonstration environment. The demonstrations were performed with both Savari and Danlaw equipment, and on a positive note, the test showed the interoperability of the two DSRC ASD vendors, but without using the security credentials; this same type of testing was repeated at the Federal Highway Turner Fairbanks Research Center in June with the security in place to once again demonstrate interoperability. A final lesson learned is that there are risks involved in driving members of the general public when trying to trigger the ASD safety applications. For best results, it is recommended to utilize professional drivers or provide adequate training prior to the demonstrations. Overall, it was an excellent learning experience for the entire NYC CVPD project team and the participants were impressed by the deployment of the V2V applications. 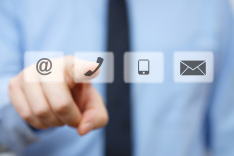 The project team is looking forward to the next round of demonstrations, which will incorporate the lessons learned from the ITS-NY Annual Meeting. 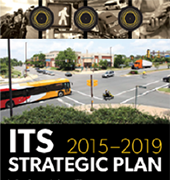 The Interoperability Test final report will be available on the CV Pilots website: https://www.its.dot.gov/pilots/.